Does celiac disease increase your risk of Alzheimer's? Advocates of a grain-free lifestyle have been known to make strong claims about the dangers of eating wheat or gluten. In particular, some have claimed that gluten has a toxic effect on the brain and is a likely contributor to the increase in Alzheimer's disease seen over the past few decades. Given that "brain fog" is a common complaint of people with celiac disease, this doesn't seem like an outlandish idea. But is it actually true? Researchers at the Celiac Disease Center of Columbia University Medical Center decided to find out. For this study, the results of which were published in the Journal of Alzheimer's Disease, the researchers conducted a comprehensive analysis of data from over 8,846 people. All of the participants were over the age of 50. 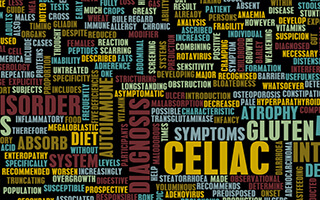 The researchers matched celiac patients with control participants who had similar characteristics, but did not suffer from celiac disease. The researchers followed the data for a median of 8.4 years. Over that time period, 4.3% of the patients with celiac disease were indeed diagnosed with Alzheimer's disease. But how did that compare to the control group? It turns out that some of them developed Alzheimer's disease as well. In fact, 4.4% of them did. You can't get numbers much closer than that. Lead author Benjamin Lebwohl, MD, concluded, "Celiac disease did not increase the risk of Alzheimer's in this population-based study." In addition, he said, "We did not find evidence of increased dementia risk prior to the diagnosis of celiac disease either." So, the researchers found that individuals with celiac disease were not at an increased risk for overall dementia. However, a subgroup showed that there may be an increased risk for vascular dementia. The researchers did find a slight increase in the risk of vascular dementia, but Dr. Lebwohl pointed out that the increase was slight enough that it may have been the result of chance. Still, as other studies have shown that celiac disease patients have modest increases in cardiovascular disease risks, the results are worth keeping in mind. People with celiac disease may want to be extra intentional about taking steps to maintain their cardiovascular health. Some multidisciplinary measures that can be effective for Alzheimer's is staying active — both mentally and physically. Eat a diet that's nutrient-dense and free of nutritional deficiencies. Even though this study did not associate celiac disease with Alzheimer's, I still have my Alzheimer's patients for the most part avoid wheat and gluten. That's because they are inflammatory for a large segment of the population. Controlling inflammation in Alzheimer's and most chronic diseases is important. This is one of the reasons psychiatrists generously prescribe omega-3 fatty acids. My patients who are genetically susceptible to Alzheimer's often ask me what they can take pro-actively. If you're over 50, consider a neuroprotective supplement such as Advanced Nerve Support. Although this supplement was initially created for nerve "pain," it contains vitamin D, benfotiamine, B6, B12, and Acetyl-L-Carnitine. All of these ingredients are neuroprotective and help maintain the myelin sheath covering and insulating the layer of nerve cells. A healthy myelin sheath makes for smooth nerve transmission from one part of the nervous system to another. In order to provide individuals with a fair-priced and safely produced supplement, the Alzheimer's Organization created a multivitamin with five of the six nutrients above. The levels in Advanced Nerve Support are identical to those used in their supporting clinical trials.